My great grandmother was the president of the Doll Club, St Petersburg Florida for several years. Obviously had an enormous collection of dolls. This beautiful doll was part of her collection. The doll is 200 yr old. Head, arms and legs are porcelain, cloth body. Name on the back is Olive Brunson. 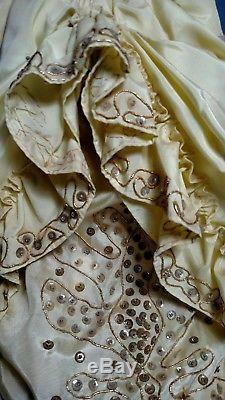 She has a gorgeous handmade yellow silk dress with very detailed gold embroidery. 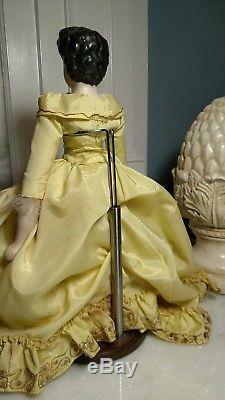 Doll can't stand on its own. Wooden cherry color base stand included. 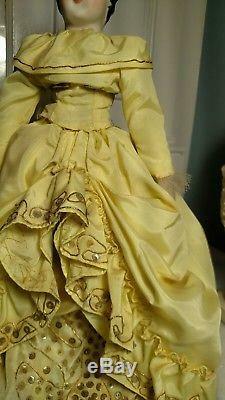 Dress has a few small spots due to the age of doll. I'll do my best to answer any questions. 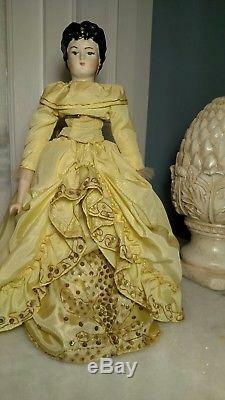 I don't know a whole lot more details about the history of the doll since her original owner has long passed away and we only have info that was passed down to her daughters every generation down. This is a perfect gift for a doll lover, will make a gorgeous addition to your doll collection or even just by herself as a decorating piece. 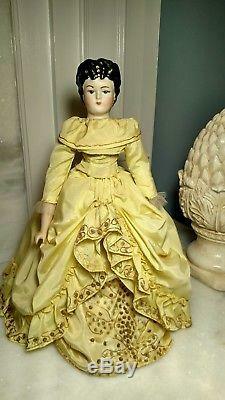 The item "Collectible Vintage Victorian 200 yr old handmade porcelain doll" is in sale since Friday, April 13, 2018. This item is in the category "Dolls & Bears\Dolls\By Material\Porcelain\Vintage (Pre-1980)". The seller is "marshmallow25-7" and is located in Rutherfordton, North Carolina. This item can be shipped to United States.